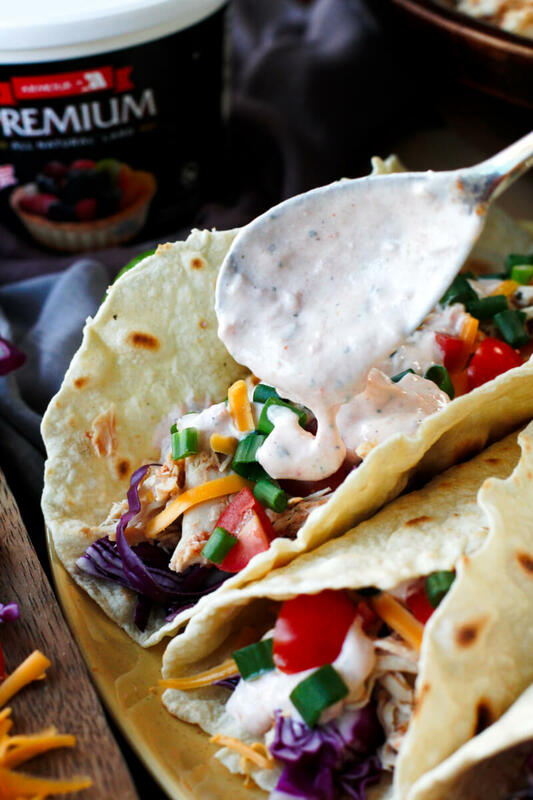 Slow Cooker Salsa Ranch Chicken Tacos are made by topping easy-to-make homemade tortillas with 3-ingredient shredded chicken, fresh veggies, and a cool greek yogurt salsa ranch. 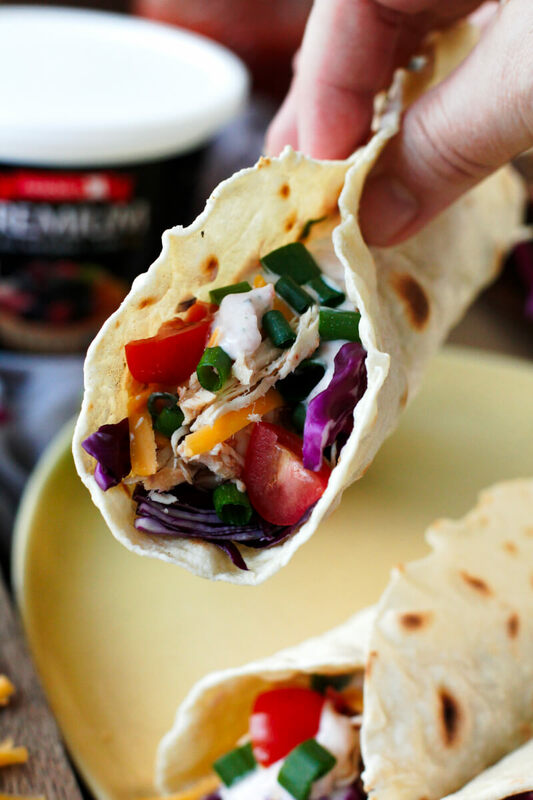 Your family will fall in love with this crockpot dinner recipe! My oldest sister who lives in Texas loves to cook like I do. She travels often and has picked up lots of great recipes and cooking tips along her way around the globe. While she and her family are avid globe-trotters, they always make time to swing back home to visit with family. Last year when she was in town for a visit her family bunked with us one night and we decided to make tacos for dinner. Both of our families love tacos and they're easy to make for a crowd. They were a natural choice! My sister asked me if I wanted to make homemade tortillas for taco night and, naturally, I said yes! I had never made tortillas from scratch before, so I was excited when she suggested it so I could take notes and soak up her technique. One of the first things she mentioned was that lard is the key to excellent tortillas. Sadly, I didn't have any lard at the time, nor had I ever had lard in my house at all. We made the tortillas with shortening, but I couldn't help but wonder what I was missing because we had skipped the lard. I'm sure you can imagine my excitement when a few months later I found Armour Premium All-Natural Lard in the baking aisle at my local Walmart! Naturally, I scooped it up so I could try my hand at homemade tortillas prepared with the key ingredient. So, let's talk lard for a minute. It's not the prettiest word, but surely there's something special about an ingredient that has been used in kitchens for generations and generations. When I think of lard, I think of grandmothers and grandfathers lovingly preparing meals from scratch. Lard has been used in kitchens for waaaaay longer than I have been on this earth! Here's what you may not know about Armour Premium All-Natural Lard. Did you know that Armour Premium All-Natural Lard is one of the healthiest fats to cook with? It's true! Lard is a better source of monounsaturated fats than butter, coconut and corn oil AND has no trans fats like shortening. What's not to love about that?! Not only is Armour Premium All-Natural Lard a healthy substitute for margarine and oils, it's also super versatile. Because lard is flavorless, it is perfect for cooking, baking, and sauteing because it won't inadvertently change up the flavor of your recipe. 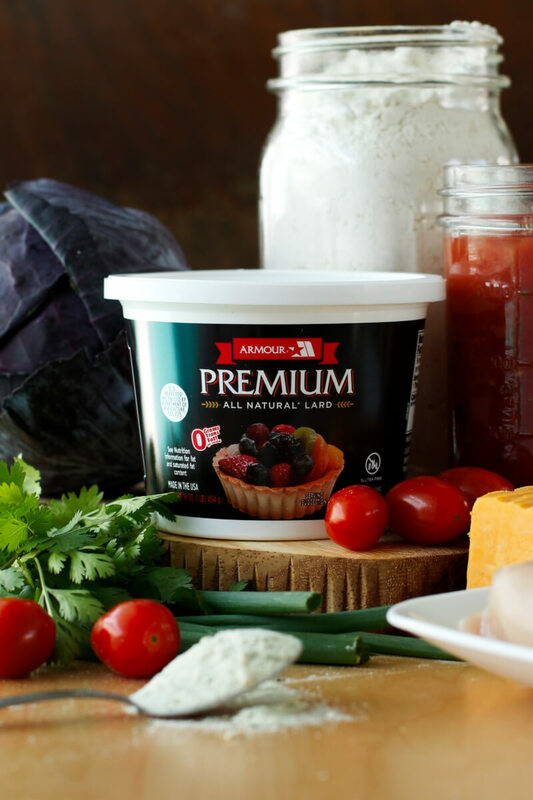 Cooking with Armour Premium All-Natural Lard is simply a healthy choice that leads to healthier recipes. As I said before, I wanted to try homemade tortillas as soon as I got my Armour Premium All-Natural Lard home. 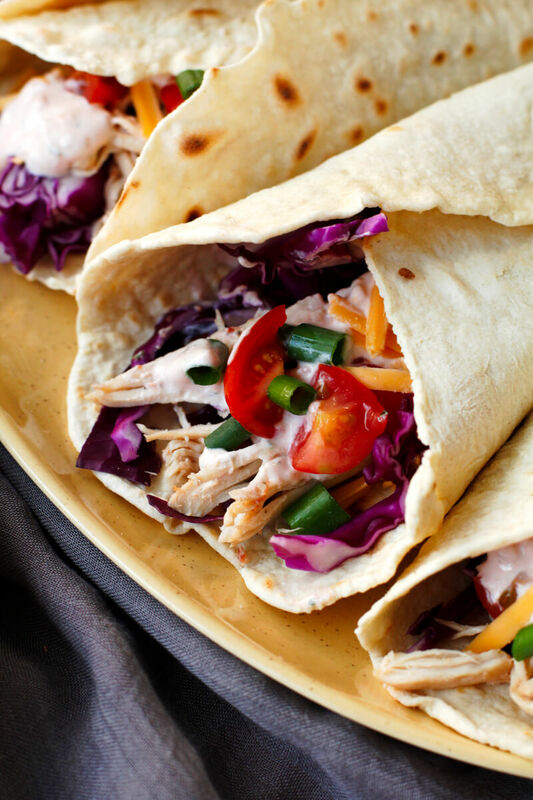 I decided to stuff my tortillas with a slow cooked shredded chicken and lots of bright, fresh veggies. 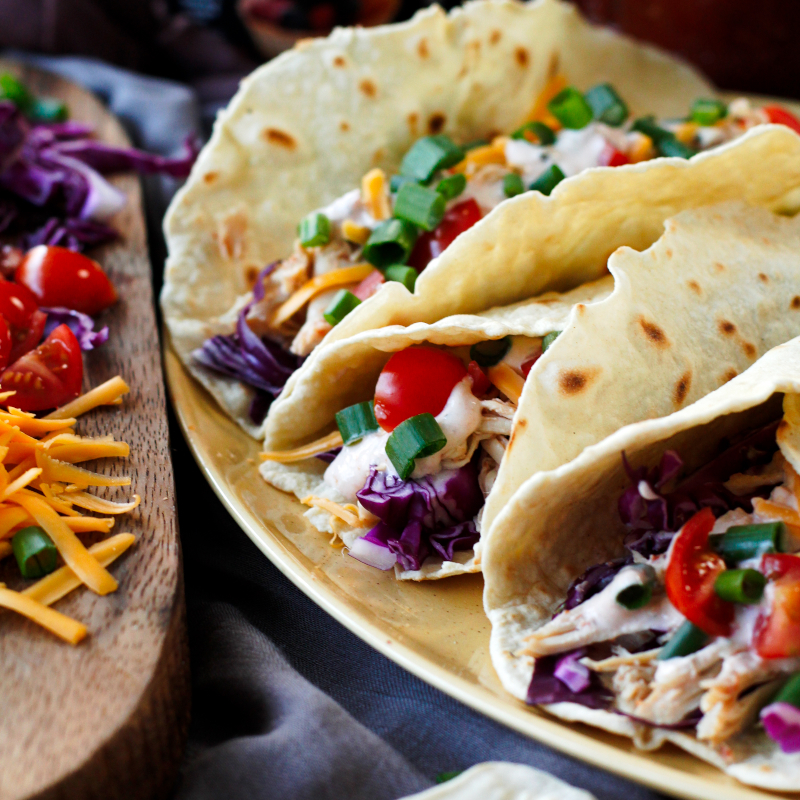 I love the term "eat the rainbow" and tacos are the perfect way to add tons of color to your meal. 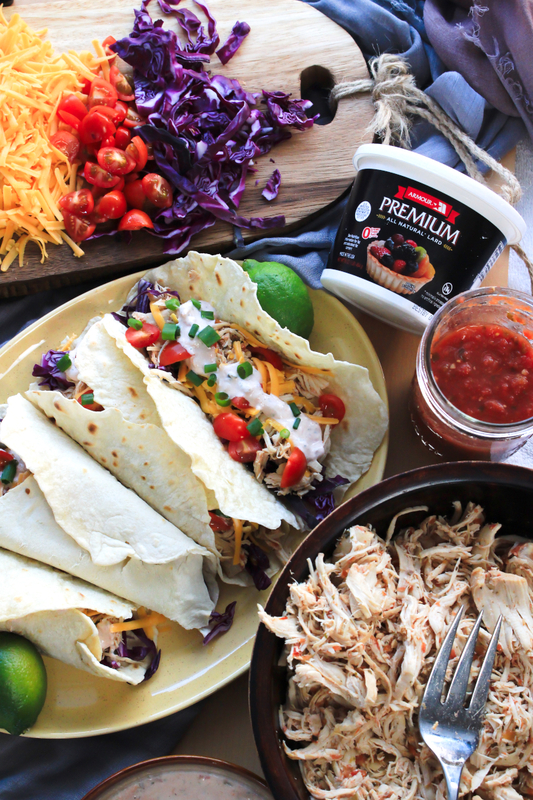 I kept the slow cooker chicken simple, using just three ingredients because I didn't want you to shy away from making the homemade tortillas! They aren't hard to prepare at all and their authentic taste is out of this world. The tortilla dough is super simple to make, no stand mixer required and very forgiving. Just make sure you use the Armour Premium All-Natural Lard! Then, get yourself a rolling pin and a cast iron skillet and you on your way to the tastiest tacos you've had in a long time. Promise! What will you make with Armour Premium All-Natural Lard? Will you saute some green beans? How about lightening up one of your favorite baked goods? No matter what you try, I know you will love this natural, sustainable ingredient in so many of your recipes! 1. Place the chicken breasts into your crock pot. Sprinkle with 1 tablespoon of the ranch mix and 1 1/2 cups of the salsa. Cover and cook on low for 6 hours or high for 4 hours. Shred the chicken with two forks. 2. Meanwhile, prepare the tortillas. In a large bowl, whisk together the flour, salt, and baking powder. Mix in the lard with your fingers until the mixture resembles cornmeal. Add the water and mix until the dough comes together, then place onto a lightly floured surface and knead until smooth and elastic. 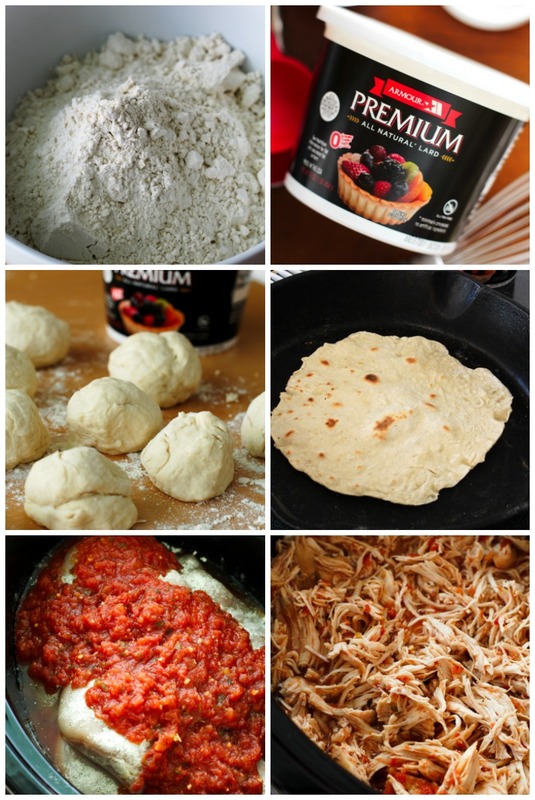 Divide the dough into 24 pieces and roll into small balls. 3. Preheat a large cast iron skillet over medium-high heat. Using your rolling pin, roll each ball into a thin, round tortilla. Place the tortillas into the skillet, one at a time, and cook until bubbly and golden. Flip and cook the other side. Keep the tortillas warm under a clean dish towel until all tortillas are cooked. 4. In a small bowl, stir together the remaining 1/2 cup salsa, the Greek yogurt, and the remaining 1 tablespoon ranch dressing mix. 5. 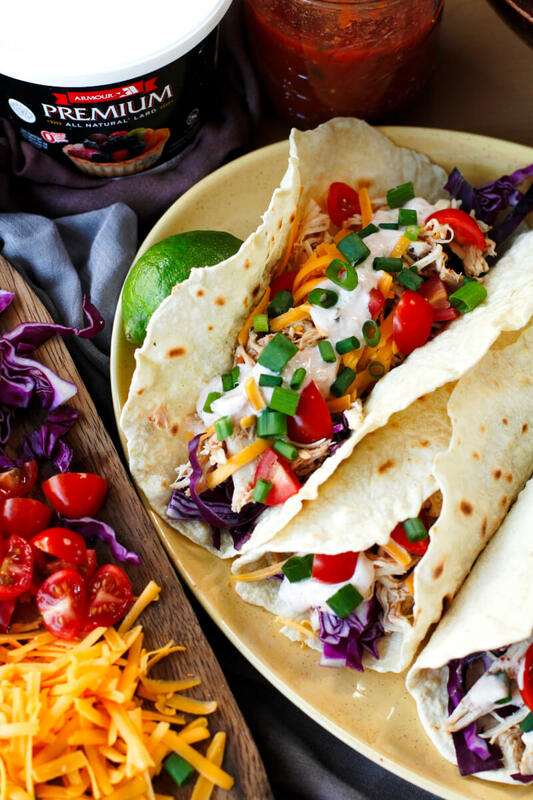 Fill each tortilla with a little bit of the shredded chicken, the shredded cabbage, chopped tomatoes, cheese, greek yogurt mix, and green onions.